With a mixture of solemnity and resolve, top state officials yesterday outlined steps taken to ensure no repeat of the 2006 dam-breach disaster that claimed seven lives on Kauai. Offering "our condolences to the families" and "our heartfelt sorrow," Maj. Gen. Robert Lee, state adjutant general, joined other Cabinet members in describing the money and manpower devoted to assessing the structural integrity of public and private dams and reservoirs across the state. "They are safe at this point, and we'll continue the checks and we'll be very vigilant and make sure they are safe for the people of Hawaii," Lee said at a state Capitol news conference on the eve of the anniversary of the Ka Loko Dam failure. 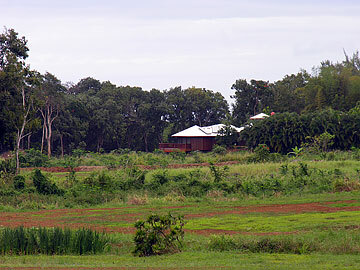 Seven people were killed when the Ka Loko Dam gave way on March 14, 2006. 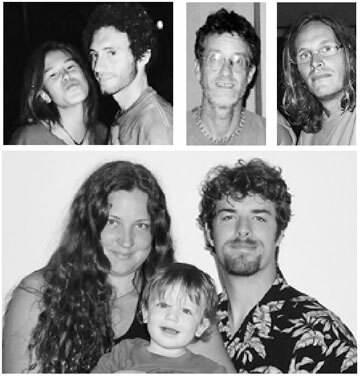 They were, from top left, couple Christina McNees and Daniel Arroyo; Wayne Rotstein; and Timothy Noonan; bottom photo, Aurora Fehring, husband Alan Dingwall and their son, Rowan Fehring-Dingwall. Peter Young, director of the state Department of Land and Natural Resources, joined Lee in vowing no future lapses in the state's dam inspection program. He said all 136 regulated dams and reservoirs in the state have been inspected at least twice, in cooperation with the Army Corps of Engineers. Two reservoirs, Waikoloa No. 1 and No. 2, above Waimea on the Big Island, were found to have damage from the Oct. 15 Kohala earthquake and were drained to prevent a failure, Young said. The county of Hawaii is handling repairs at the two reservoirs. Additionally, the state has been checking some unregulated dams and working with the owners of private reservoirs to make sure they are maintained properly, Young said. "There is no imminent threat, no immediate danger from any of the reservoirs based on the inspections that have occurred, and necessary repairs are ongoing," he said. DLNR has increased its dam-safety staff and is requesting $20 million this year for repairs to dams on DLNR land, Young said. The state Agriculture Department has requested $10 million for maintenance on dams under its authority. Meanwhile, under a $750,000 state contract, the Maui-based Pacific Disaster Center is creating models of what effects dam breaches would have on communities around the state. The state has a risk classification system that ranks dams and reservoirs on the basis of how much damage such incidents would cause. 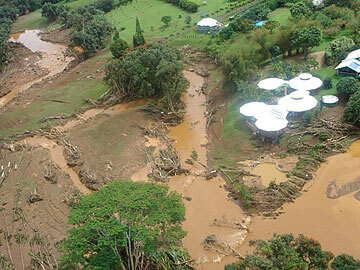 Seven Kauai residents died March 14, 2006, when an earthen dam at Ka Loko Reservoir breached after heavy rains, sending 1.6 million tons of water downstream through the property of Bruce Fehring. The victims included Fehring's daughter, Aurora; her husband, Alan Dingwall; their son, Rowan Fehring-Dingwall; and residents Daniel Arroyo, Christina McNees, Wayne Rotstein and Timothy Noonan. "We're overwhelmed by the sense of loss," Bruce Fehring said in a telephone interview Monday, adding that the sorrow is "compounded" by two recent fatal helicopter crashes on Kauai. "It's hard not to be shocked." He said he is keeping busy with legal paperwork and repairs to the property. "I have a lot of distractions and I am able to speak in public and to the media about our feelings," he said. "My wife is not doing nearly as well in that regard." His wife, Cyndee, was able to share her feelings on an ABC "20/20" episode that aired March 2. "She kind of walked away exhausted from that, and the one-year anniversary is not helping," Fehring said. "But we have other children, so we have other responsibilities and distractions that keep us putting one foot in front of the other." A report by Robert Godbey, the special deputy attorney general who investigated the dam breach, made some recommendations on upgrading the dam-safety program that have been incorporated into bills now before the Legislature. "The ball is now in the Legislature's court, and I'm very impressed with their thoughtful approach to it," Godbey said in an interview. House Speaker Calvin Say said yesterday that a hearing last month on Kauai persuaded him that the measures need to address both safety and farmers' need for water. "If the legislation is too strong on the penalty side on landowners, a lot of them may just close the dams and reservoirs so the liability is minimal," Say said. "That is the dilemma that is happening statewide."